Police expected to force Levy to install metal detectors, extra security cameras and maintain extra guards following Thursday's stabbing. Police will likely instructed businessman Rami Levy to boost his security measures in the stores under his ownership in Judea and Samaria following Thursday’s deadly attack at the store in Sha’ar Binyamin. It is expected that the instruction will be issued by the police at a hearing which will be set today with the businessman or one of his representatives. On Sunday IDF soldiers were checking shoppers for weapons at the supermarket. Two people, one aged 36 and the other 21, were wounded in the attack, one critically and the other moderately with both suffering stab wounds to the upper body. The 21-year-old victim, IDF Sergeant Tuvia Yanai Weissman later succumbed to his wounds. Following a police investigation it was discovered that the two Palestinian terrorists, both of whom were aged 14, entered the Rami Levy store without being checked by the security guard who was stationed at the entrance. The police are expected to instruct Levy to set up additional security guards, stationary as well as hand-held metal detectors, and additional security cameras where needed. As of Sunday morning, stationary metal detectors had been set up at the Sha’ar Binyamin store. While the number of shoppers dwindled at the Sha’ar Binyamin store over the weekend following the attack, Yediot Aharonot reported that shoppers returned in full force on Sunday and were resolute in their decision to keep shopping at the stores. 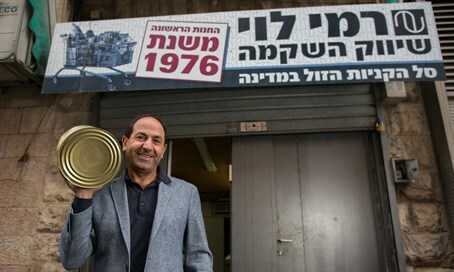 The Rami Levy stores which are frequented by both Israeli and Palestinian shoppers, have been hailed as a symbol of coexistence. However they have also been a target for terror during the recent terror wave. The opening of the stores to Palestinian consumers is playing a big part in why the police are cracking down on security throughout the supermarket chain.